Here are two more cases where negative images of Native Americans in historic public art have stirred citizen complaints, echoing the debates about confederate statues in the south. The “Early Days” statue in San Fransisco will be removed. It is one five pieces of a larger monument. Communities are facing critical questions about what values and stories they want displayed in their public spaces — and whether to hold onto some artwork simply because it’s old. 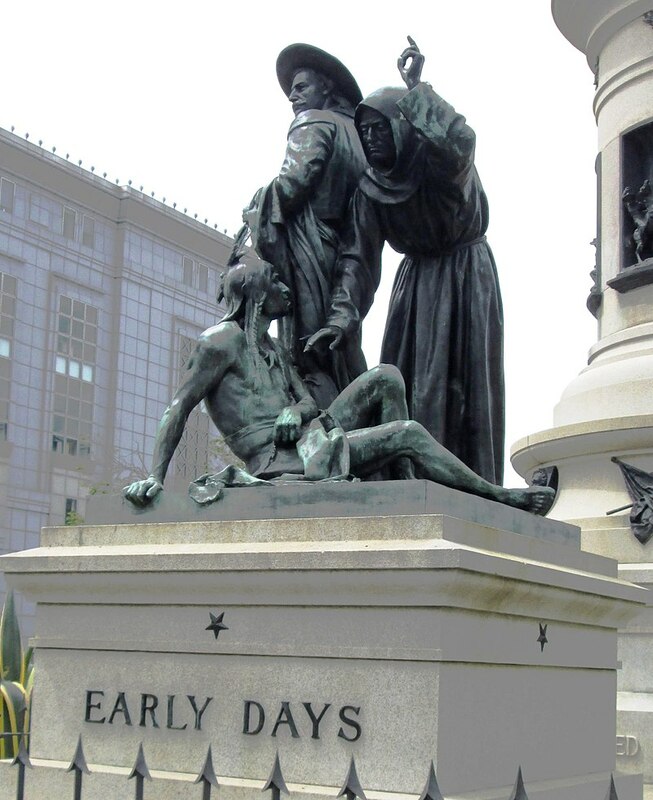 In San Fransisco, the city’s Arts Commission voted unanimously March 5 to remove a public statue titled “Early Days”. The statue “depicts a vaquero and a missionary standing over a sitting Native American,” according to an NPR story. It sends a clear message of who is on top and who is on the bottom, who has power and who does not. “Early Days” was erected in 1894 as part of the five-piece Pioneer Monument, according to a San Fransisco city report. Pioneer Monument consists of one central monument standing 47-feet tall, surrounded by four smaller pedestal monuments. Pioneer Monument is a testament to Manifest Destiny. One bas relief on the main monument shows “California’s Progress Under American Rule,” and one of five portrait medallions honors Father Junipero Serra who created the California mission system. The five-piece monument was moved from its original site in the 1990s to make way for the new San Fransisco City Library. At the time, Native American community members pushed, unsuccessfully, to have the whole monument retired. They especially wanted “Early Days” removed, as it was “seen as a symbolization of the degradation and genocide of Native Americans,” the city report said. “Early Days” now will be “retained and preserved at an off-site storage facility,” according to the NPR story. A plaque will be installed at the site to explain its removal. 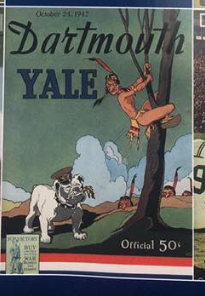 Image of historic Dartmouth-Yale Football program reprinted for this year’s game. This is a story about racist images of Native Americans in historic art — and how in many cases the dominant culture sees them as quaintly historic but fails to see that they are still painfully racist. This current story comes out of Yale University. It points out how even our institutions of higher learning can be blind to the racist messages embedded in artwork. This past Saturday, the Yale-Dartmouth football game marked the 100th anniversary of the rivalry. To commemorate the event, the Yale Athletic Department printed a special program. I can imagine a group of designers thinking it would be fun to run a collage of historic program covers on the front.